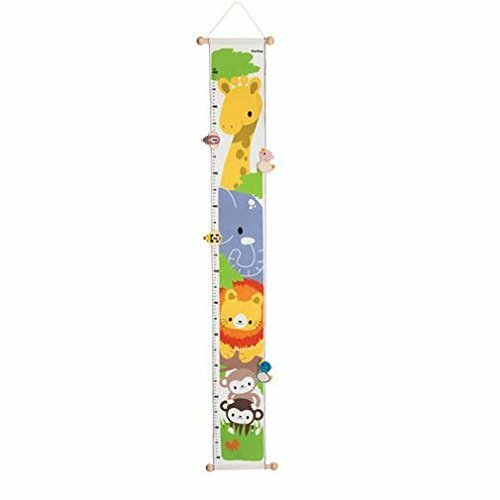 Choose a jungle printed canvas growth chart for your kids! This set comescomplete with 4 animal measuring clips, which are movable from height toheight. Measures heights from 40-160 cm and hangs easily from the attachedrope at the top of the chart. For more than 30 years, PlanToys has beenconsistently developing its products and activities with a strong commitmentto contribute positively to the world. By implementing best practices andtaking innovation of toy-making and design to the next level, PlanToys is notonly known as being the first company to manufacture wooden toys frompreservative-free rubber wood, we are a leading company that has created a newmaterial and process as part of our zero waste goals. Continuing ourcommitment for a sustainable future, PlanToys has introduced PlanWood asanother high quality, safe, and sustainable material in our toy-makingprocess. This material will be used in harmony with our solid rubber wood.PlanWood is an eco-friendly material because the waste is minimized and fewertrees are reclaimed. The less energy, used to produce PlanWood ultimatelyreduces our environmental impact. PlanToys values have been rooted fromembracing Mother Nature. The company has grown their green values into valuesof Sustainable Play. Sustainable Play is the foundation of how our toyscultivate creative minds and bring children closer to nature.